Well its been 5 days and I am still in trance. Every second, every blink of eye, I go back to the rainy night in Bangalore when kanteerava stadium witnessed history. 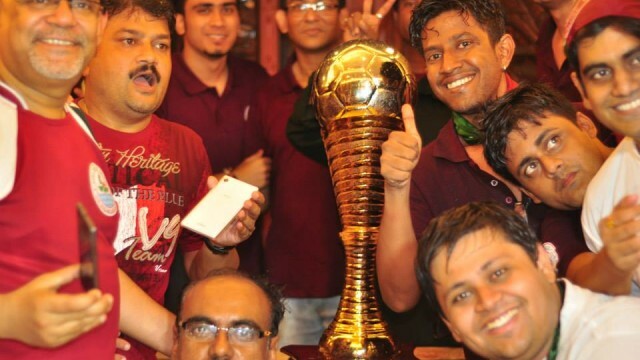 It has been a long year and a even longer painstaking journey of 5 years that mariners (Mohun Bagan fans) have going through. The National Club of India without a trophy worth mentioning was not what would history ideally scripted but then that was the fact. My humble eyes had witnessed many a battles that 11 warriors clad on green and maroon had fought in the green battlefield but none of them was as historic as important as the one fought on the night of 31st May 2015. Its going to be a long post, so grab your beer and ride along. 30th morning I took the flight to Bangalore from Mumbai wearing the colors in which I was born and in which I pray I am draped for my final journey. It was fascinating as when I landed in Bangalore, I knew that in majority of the flights landing in Bangalore that day or the next day, there will be a mariner traveling, carrying the dreams and hopes of millions back home. I was joined in the airport by Snehashis Bhattacharya Mayukh Roy and Suman Ganguly. Just after us Kaushik Dutta da and his family had landed from Mumbai and Rajshankar Ghosh da had landed from Delhi. As we touched down on the soil of silicon city, suddenly, I realized the weight of expectations and dreams that we were carrying. We knew whichever way the dice rolled, it would be etched in our memories and penned down in history for ever. Post checking in our hotel, we went yo the stadium to watch our team practice. We were welcomed there by our brothers from Mariners at Bangalore and many others from Kolkata. There were hugh cardboard cuttings of boat and prawns that the Bangalore mariners had bought and it was like a festive atmosphere prior to the match. The mood was very well captured by the Bengali mainstream media who too had come in full force to be a part of history. We were tensed but somewhere up there the little birdie was singing our tune. Later in the evening we had a small pre match party wherein the Mumbai Pune Mariners were joined by Somak Mohunbagani Ghosh da and Surojit da for a tension relieving elixir session. Cut to match day prime time action, dark dense clouds had covered Bangalore skyline and it had started drizzling at around 4 pm when we left our hotel for the stadium. All of us were clad in green and maroon with each carrying some or the other items that that considered the lucky charm. By the time we reached stadium it was nearly pouring. The west end was were the supporters of both the sides had gathered and the ultras were clearly differentiated by the colors of the mother club. While one end was clustered by the blues, the other end was painted green and maroon. The match was still a good 2 hours away but the frenzy was building up. The vocal fight was on between the fans and I am sure the city’s decibel records were broken quite a few times during the course of those few hours. The chants of ‘Amra Karaa’ was equally replied by bfc chants of ‘who are we’ and it was like two armies preparing for the last battle. Once the team bus came in, supporters of both the teams made their way into the stadium. And from there on it was a fight between East Lower B and North Stand where most of the 2000 strong mariners had anchored their sail against West Block A which was painted blue by the bfc fans. One quick comparison between the two set of fans and their supporting pattern. While mariners where in with their traditional long flags and the epic amra Kara chants, bfc supporters were more of waving large hand flags and singing songs types. The difference between historic tradition and the the impact of European soccer was clearly evident. What must be highlighted is the initiatives of mariners @ Bangalore to give green and maroon scarves to each supporter and the green and maroon plastic board to create a Hugh mosaic pattern. All of it was a resounding success as was the first attempt by 1000+ fans to sing ‘amader Surya maroon’ together. I won’t go much into the technicals details of the match because I was so tensed that I barely watched 25% of the match live. But the one thing everyone will vouch for is the fact that the atmosphere was electrifying throughout the match well complimenting the heavy showers and thunderbolts which also got sketched in history. The list goal and post match celebration cannot be described in words and it will be injustice to the moment if I attempt to pen it down. The dreams of billions were fulfilled .. I saw kids dancing in rain, I saw elders weeping like a toddler, I saw Holi being played with two colours, I saw people shrieking with joy, I saw people clinging on the flags and crests and dancing like this was their last celebration, I saw club officials dancing with us, I saw players coming and saluting the spirit of fans, I saw Mohun Bagan my mother club lifting the I League 2015, I saw 125 year old boat, raising its head once again over the turbulent waters, fluttering it’d green and maroon sail and vociferously telling its billion sailors, the sail has been hoisted again, let us ride over all the waved and row together towards a new dawn. Proud to be a sailor, proud of my green and maroon colors. I will be with you till my last breathe and will witness many more journeys and victories together. Joy Mohun Bagan.